More than three dozen homes went up in flames Monday when fires and explosions erupted in northern Massachusetts in what were believed to be gas-related incidents, authorities said. 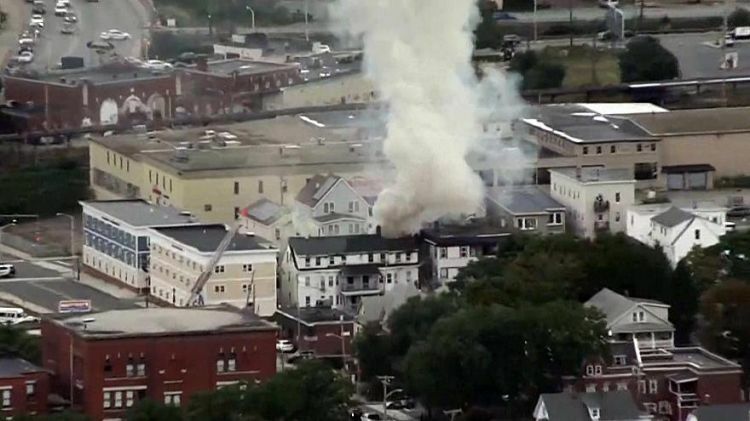 Massachusetts State Police told NBC News that at least 39 locations were affected by fires or explosions. The blazes were reported "across a wide swath of dozens of blocks" in the city of Lawrence and the town of North Andover, according to a tweet from the agency. The state police described the incidents as gas explosions and structure fires and said they were also reported in the town of Andover. State officials told residents who have gas service from Columbia Gas of Massachusetts to evacuate their homes immediately and said gas lines were being depressurized by the company. Lawrence police Chief Roy Vasque told The Eagle-Tribune, which covers the Merrimack Valley, that he'd "never seen anything like this." The state police tweeted that local authorities and state troopers were helping evacuate residents to a senior center and a middle school while detectives and others investigated multiple scenes. "Far too early to speculate on cause," the state police tweeted, adding that a joint investigation will be conducted when the situations is stabilized. A spokesperson for Columbia Gas told NBC News that the company is advising people who smell gas in the Lawrence area to evacuate, get to a safe location, and not to open or close any windows or doors. Gov. Charlie Baker said on Twitter that he's monitoring the situation and that he urged residents to "heed instructions from local officials" about evacuations and "suspending gas usage."